Listen up sports fans, here's some theater for you! With the media continuing to explode about athlete safety with concussions, comes Eric William Morris and Ashley Rodbro’s's Running Interference. The drama follows pro quarterback Ryan as he visits high school pals Jenny and Ben and their son Charlie at the family beach house. Through a series of flashbacks and clever inside the huddle bits, we learn that Ryan has a history of concussions and the latest caused a massive life change. Ryan not only tears apart his own life but those around him. 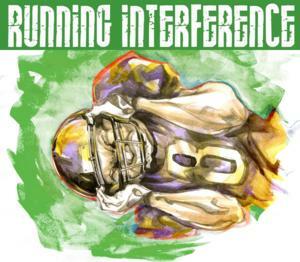 Running Interference is an important story about the psychological downfall of an athlete. With the "do anything to win" mentality" that is destroying the game, Running Interference couldn't come at a better time. But important doesn't always mean powerful. The way the piece is structured, Morris and Rodbro spend a lot of time in the past rather than figuring out the present. The woes of the high school flashback force exposition that can easily be summed up in a line or two. Or figured out by an audience who saw it coming a mile away. Ryan's antics are what make this piece relevant. With such interesting material and commentary, it's interesting to see that Jenny and Ben do not comment on Charlie's future in the game. They know that their son has promise and a decent arm but after watching the downfall of Ryan, what parent would want their child to endure that potential life? It's another layer that Morris and Rodrbo could develop into their poignant story. As focal character Ryan, Jeff Todesco was a pro. The mental state of Ryan was certainly difficult to actively portray but Todesco managed to sell it and sell it well. As husband and wife, Terra Mackintosh and Adam Petchel had the extraordinary task of playing parent to both their own son and their adult friend. Mackintosh and Petchel both had fun in their performance. Harrison Chad as young Charlie played up the all-knowing youth card. Chad offered a solid performance that you wish you got to see more of. Directed by Jonathan Judge-Russo, Running Interference escaped the tackles and zoomed down field. Judge-Russo allowed the slow moments to stew by keeping the overall pace high. The scenic design by Adam Wyron featured some summer lawn furniture and a series of panels against the black masking. And you spent the entire show waiting for the panels to do something aside from sit there and break up the monetary of the Fringe space. Sadly, they didn’t. The sound design by Nara Shin was quite exceptional, especially when it came to the voice overs. Shin allowed you to feel as if you were alone in Ryan’s helmet. The elimination of sound was essential for the moments to feel accurate. Running Interference is a very poignant play that shares a story that deserves to be heard. But is this story captivating enough to open more eyes? It’s doubtful. Morris and Rodbro have something on their hands with great potential.